Nurses in the US must pass a challenging exam known as the NCLEX (National Council Licensure Examination) before beginning their career in the healthcare industry. This exam is a popular measure for the quality of an institution’s nursing program, with NCLEX pass rates used for comparison with other nursing schools. 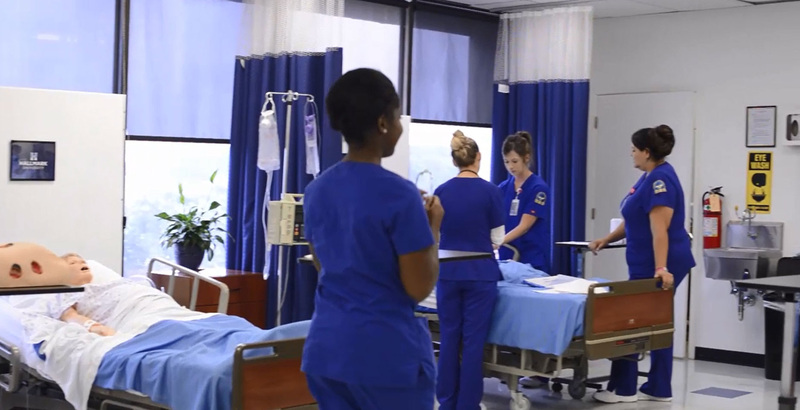 First-time pass rates for Hallmark University have surpassed the national average and are nearing 90%, showcasing the effectiveness of Hallmark’s unique nursing school. This required exam not only tests graduating nursing students but the nursing program itself, as nursing schools must have an 80% first-time pass rate to receive approval by the state board of nursing. Reaching this status is a difficult task, as the NCLEX is updated periodically and has an increasing required benchmark pass rate, creating a challenge for educators to meet these standards. This challenge has been taken on by Hallmark University’s Dean for the School of Nursing, Dr. Gabriel Oluwakotanmi. Hallmark’s NCLEX pass rates reflect its commitment to producing the next generation of nurses as a shortage of qualified personnel disrupts the healthcare industry in the US. In May of 2018, Hallmark announced its new Bachelors of Science in Nursing program to the San Antonio community, with students able to earn their BSN in under 32 months. Future graduates of this program will move on to lead others in the nursing and healthcare industry, providing a much-needed service to their patients and communities.